Glass Desks are often associated with executive offices, management desking and impressive director’s private office workspaces. Whilst glass desktops remain a popular choice at boardroom level, we believe in offering quality glass desks for a wider range of workers to benefit from as well. Glass desks bring a softer edge to the modern office environment, combining quality materials to create a professional and timeless aesthetic. With a variety of frame options, shaped aluminium legs or crafted wooden bases, we can offer contemporary glass desking with returns, corner options, free-standing or modular glass office desks; painted, frosted, etched – you name it, we can supply it! Glass Office Desks offer an impressive work surface, encouraging creativity and simultaneously projecting importance and authority. Available with supporting service storage returns, our range of glass desks complement all executive office furniture requirements. We can also provide serigraphy glass with black or white serigraphy printing and there is the possibility of customising your glass office desk to best suit your requirements, such as a bespoke table top design as well as various combinations of base and desk top. Tiper Executive Desk offers the modern corporate office space freedom for creativity with its modularity. 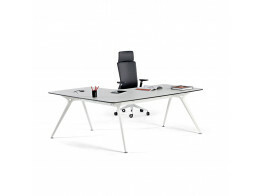 DR Executive Office Desks are available as a free standing desk or with supporting storage returns. 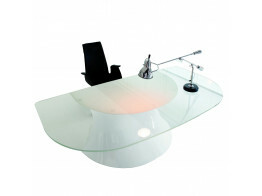 Ola Executive Office Desk is a custom made desk with glass or real wood desk tops and a beautifully formed base. 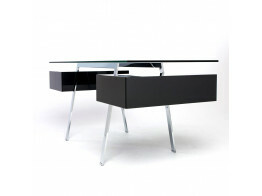 Forma Kristall Desks feature 19mm thick glass desktops for a modern office table piece. 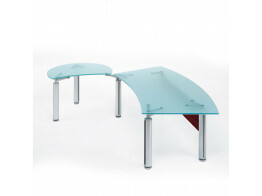 Arkitek Glass Desk include bench desks, returns, individual and management options.